ATHENS, Ga. -- Police say a fearful 11-year-old Georgia girl who took a knife to school told officers she needed the weapon to fend off clowns. The Athens Banner-Herald reports the girl was arrested Friday at Burney-Harris-Lyons Middle School in Athens amid reports and social media posts about clowns frightening children in Georgia and other states. An Athens-Clarke County police report states the girl said she needed the knife to protect her and her family because she had heard the stories about clowns jumping out of the woods and attacking children. Police say they released the girl to her mother on a charge of possession of a weapon on school grounds. 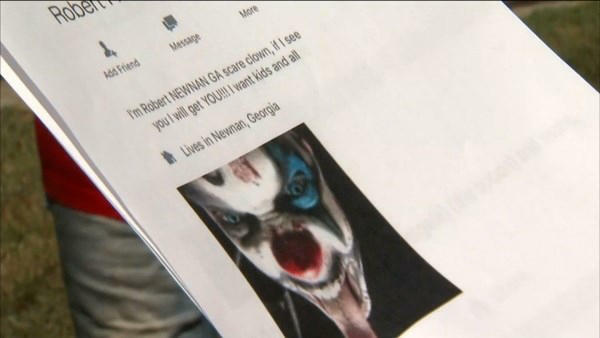 In Coweta County, southwest of Atlanta, police were investigating a suspicious Facebook post by a man claiming to be “The Newnan Clown,” CBS Atlanta affiliate WGCL-TV reports​. The profile, which has since been made private, said, “If I see you, I will get You!!! I want kids and all,” WGCL-TV reports. In neighboring Alabama, law enforcement officials are warning that people involved in a rash of creepy clown hoaxes across the state could be prosecuted.